Sensory integration disorder or dysfunction (SID) is a neurological disorder that results from the brain’s inability to integrate certain information received from the body’s five basic sensory systems. These sensory systems are responsible for detecting sights, sounds, smell, tastes, temperatures, pain, and the position and movements of the body. The brain then forms a combined picture of this information in order for the body to make sense of its surroundings and react to them appropriately. The ongoing relationship between behavior and brain functioning is called sensory integration (SI), a theory that was first pioneered by A. Jean Ayres, Ph.D., OTR, in the 1960s. Sensory experiences include touch, movement, body awareness, sight, sound, smell, taste and the pull of gravity. Distinguishing among these is the process of sensory integration (SI). While the process of SI occurs automatically and without effort for most, for some the process is inefficient. Extensive effort and attention are required in these individuals for SI to occur, without a guarantee of its being accomplished. When this happens, goals are not easily completed, resulting in sensory integration disorder (SID). The normal process of SI begins before birth and continues throughout life, with the majority of SI development occurring before the early teenage years. The increased refinement and effectiveness of SI coincides with the aging process, as it determines how well motor and speech skills and emotional stability develop. Ayres’ initial work on the SI theory instigated ongoing research that looks at the crucial foundation that SI provides for complex learning and behavior throughout life. 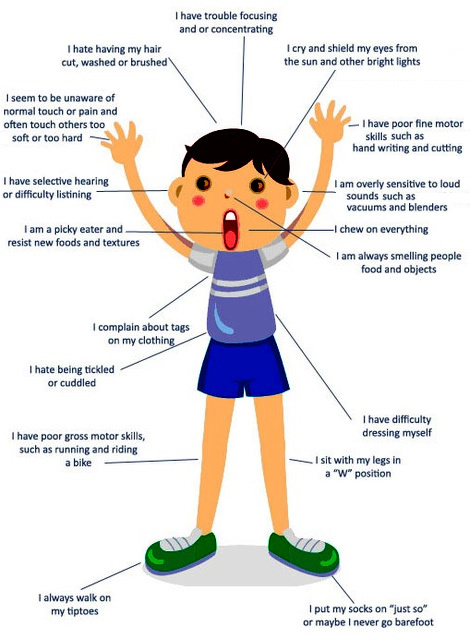 The presence of a sensory integration disorder is typically detected in young children. While most children develop SI during the course of ordinary childhood activities, which helps establish such things as the ability for motor planning and adapting to incoming sensations, others SI ability does not develop as efficiently. When their process is disordered, a variety of problems in learning, development, or behavior become obvious. Those who have sensory integration dysfunction may be unable to respond to certain sensory information by planning and organizing what needs to be done in an appropriate and automatic manner. This failure may trigger a primitive survival mechanism called “fright, flight, and fight,” or withdrawal response, which originates from the “primitive” part of the brain, the limbic system. This response often appears extreme and inappropriate to the particular situation. While research indicates that sensory integrative problems are found in up to 70% of children who are considered learning-disabled by schools, the problems of sensory integration are not confined to children with learning disabilities. SID is found in people of all age groups, as well as intellectual levels and socioeconomic groups. Factors that contribute to SID include: premature birth; autism and other developmental disorders; learning disabilities; delinquency and substance abuse due to learning disabilities; stress-related disorders; and brain injury. Two of the biggest contributing conditions are autism and attention-deficit hyperactivity disorder (ADHD). In order to determine the presence of SID, an evaluation may be conducted by a qualified occupational or physical therapist. An evaluation normally consists of both standardized testing and structured observations of responses to sensory stimulation, posture, balance, coordination, and eye movements. These test results and assessment data, along with information from other professionals and parents, are carefully analyzed by the therapist, who then makes recommendations about appropriate treatment. Therapeutic body brushing is often used on children (not infants) who overreact to tactile stimulation. A specific nonscratching surgical brush is used to make firm brisk movements over most of the body, especially the arms, legs, hands, back, and soles of the feet. A technique of deep joint compression follows the brushing. Usually begun by an occupational therapist, the technique is taught to parents, who must carry out the procedure for three to five minutes six to eight times a day. The time needed for brushing is reduced as the child begins to respond more normally to touch. In order for this therapy to be effective, the correct brush and technique must be used. A report in 1998 indicates that the use of cerebral electrical stimulation (CES) is helpful to children with such conditions such as moderate to severe autistic spectrum disorders, learning disabilities, and sensory integration dysfunction. CES is a modification of Transcutaneous Electrical Nerve Stimulation (TENS) technology that has been used to treat adults with various pain problems, including arthritis and carpal tunnel syndrome. TENS therapy uses a low voltage electric current applied to the body through the skin with the goal of replacing painful impressions with a massage-like sensation. A much lower current is used for CES than that used for traditional TENS, and the electrodes are placed on the scalp or ears. Occupational therapists who have studied the use of CES suggest that CES for children with SID can result in improved brain activity. The device is worn by children at home for 10 minutes at a time twice per day. Occupational therapists play a key role in the conventional treatment of SID. By providing sensory integration therapy, occupational therapists are able to supply the vital sensory input and experiences that children with SID need to grow and learn. Also referred to as a “sensory diet,” this type of therapy involves a planned and scheduled activity program implemented by an occupational therapist, with each “diet” being designed and developed to meet the needs of the child’s nervous system. A sensory diet stimulates the “near” senses (tactile, vestibular, and proprioceptive) with a combination of alerting, organizing, and calming techniques. The sensory integrative approach is guided by one important aspect—the child’s motivation in selection of the activities. By becoming actively involved, and explore activities that provide sensory experiences most beneficial to them, children become more mature and efficient at organizing sensory information. By combining alternative and conventional treatments and providing these therapies at an early age, sensory integration disorder may be managed successfully. The ultimate goal of both types of treatment is for the individual to be better able to interact with his or her environment in a more successful and adaptive way.